BlackRadioIsBack.com Music: 9th Prince | BlackRadioIsBack.com - Official Blog of the Syndicated FuseBox Radio Broadcast! We're going to give you a little bit of music and things from Wu-Tang Clan affiliate folks today, especially with that Wu: The Story of the Wu-Tang Clan documentary dropping on DVD today to the masses (which by the way is absolutely fantastic, even if you're not the biggeest fan of the Hip-Hop crew). Staten Island, New York Hip-Hop MC 9th Prince is the brother of the RZA and one of the founding members of Wu-Tang Clan affiliate group Killarmy. 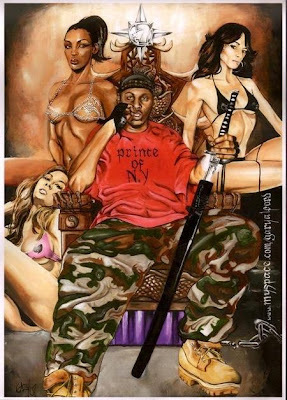 Having been on the grind for a while with that crew as well as various solo releases (the last official of which was the Granddaddy Flow album in 2003), mixtapes and guest appearances on various releases from Wu-Tang Clan members and fellow independent Hip-Hop heads, 9th Prince has a brief stint of being incarcarated when the first version of Prince of New York dropped earlier this year. Now, this album has been re-released this past week through Armyourself Entertainment & Babygrande Records with a lot of extra tracks and bonuses up in the mix for folks to get into. In our personal opinion, 9th Prince's project is Hip-Hop not just for those who are fans of the Wu-Tang Clan's style of Hip-Hop (especially the older works), but it's also for Hip-Hop heads who like that 1990s NYC Street Hip-Hop sound and vibe. Over here, the BlackRadioIsBack.com family are good with the vast majority of Prince of New York (liked to loved 13 out of 17 tracks) and enjoyed it as a solid and quality independent Hip-Hop release. Check out the free 9th Prince downloads provided below of the single "Bottomline" (with the video below) and one of BlackRadioIsBack.com's favorite joints from the album, "The Writer", along with the tracklisting for the album and some extra music videos from Back in the Day.